I discovered the strengths and weaknesses of my suspension setup in my Ford Focus RS. October 13, 2018 I headed to the BB&T Center for another autocross with the Porsche Club of America – Gold Coast region. Once again I am out there to exercise my driving skills and test the setup on my 2016 Ford Focus RS. This time around, I kept the DSC controller in my car paired up with my Steeda adjustable rear sway bar and stage 1 93 octane tune by Tune+. I decided to run with the tune this time, as I was competing against some friends in the Non-Porsche class instead of my normal B Street SCCA classing (remember kids, cheaters never win). This time around, I’m running against 15 other competitors including a top local driver piloting a Honda S2000 CR. In the Non-Porsche class, I came 2nd to the S2000 CR and beating a raw time of another competitor in a BMW Z4 M Coupé, that I am always 2 seconds behind in most of the local autocross events. Part of my success I attribute to the course setup, the RS’s GKN Twinster torque vectoring system, and the freshly repaved parking lot that left it a bit greasy. Don’t let my advantages let you think that I dusted the competition. I was still +2.572 seconds behind the S2000, CR and had a prepped CAMC S197 Mustang nipping at my heels by +0.089 seconds. The BMW Z4 M Coupé fell behind to me by +.358 seconds, as a result of some slipping around and spinning out on one of his runs. These results made me want to look a little bit harder at my setup and driving style. Reports of onlookers and corner workers were telling of the stiff rear suspension again. I was still in Tri-pod Mode. The car is three-wheeling into hard turns. Some could argue that this is a good thing for cars needing front end traction into turns to help relieve understeer and gain grip to speed out of turns. While that mostly applies to front wheel drive cars, I’m doing a disservice to the engineers at GKN by not letting the torque vectoring give grip to all 4 corners of the car. Sure, the AWD system is smart enough to send more power to the other wheels, but more grip = more power and faster times. This brings me to my conclusion about my setup. My Ford Focus RS is too stiff in the rear. I will have to set the rear bar to the soft setting, or sell it and just get a stiffer front sway bar. If I decide to still keep with the rear bar, I will probably have to adjust the track settings on the DSC Controller so stiffen up the front even more (if it’s even possible) in Sport mode for autocross. Soft will be more forgiving to the rear and let the Twinster system manage the rear power more. I think the track mode should still be reserved for the higher speed sweepers and higher speed corners that a road course can provide. 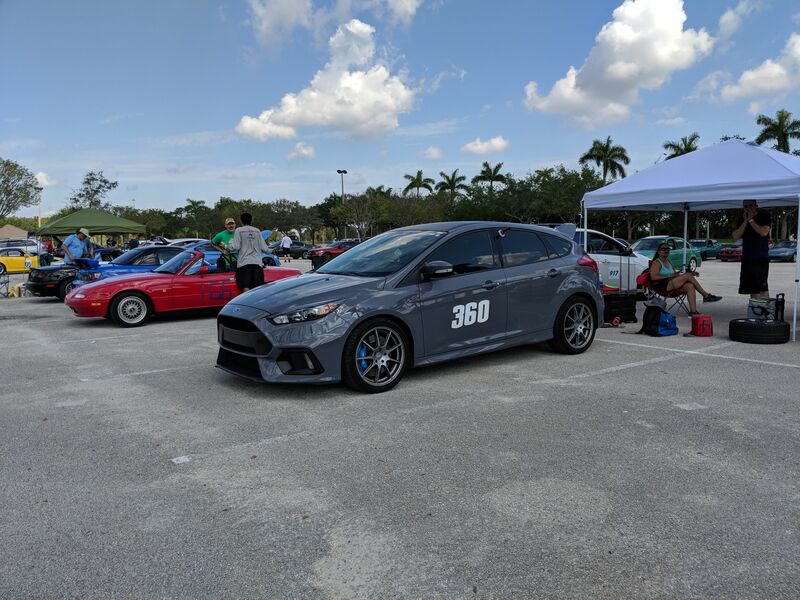 On September 23, 2018 I went to my local autocross club (ERSCC) event. Not completely convinced with my results from my last time autocross testing the DSC Controller for my 2016 Focus RS, I decided to keep control testing the stock controller vs the DSC Sport suspension controller. The results I got this round was similar and different at the same time. Contradictory, I know, but let me explain. I changed up my testing variation this time around. I started with the DSC controller installed in my car on the first run and then alternated to the stock controller, opposite of what I did last time. We also changed locations of the BB&T Center parking lot that is normally used for autocross. For this event we ran on a different lot, less beat up with less undulations that our club was normally accustomed to here. I alternated controllers from stock to DSC this time. On Run 2, we had some timing difficulties and got a re-run for Run 3, which is why the DSC was used twice in a row. Run 5 I encountered a cone penalty which added 2 seconds to my time, which potentially gave me the best time with the DSC controller. I received some feed back from friends and other spotters on the course near the beginning of the slalom stating that I entered “Tri-pod Mode”. The car was three-wheeling during the transition from a left hand sweeper into the longer slalom on the course. This is normal during these types of transitions on an autocross course, especially with front wheel drive type vehicles, but I think this was also more pronounced due to the Steeda adjustable rear sway bar I have installed. Let’s get back to results. So my results were the same as my first autocross test with the suspension controllers, that my lap times improved fairly consistently (ignoring the cone penalties). This time, I didn’t get to have 3 runs on each controller, but the best time I received was paired with the stock controller. I’d have to say that this, was probably more of a result of my amateur level of autocross driving, because each run I noticed I was slower in different corners of the course. I’ll have to concentrate on improving one section at a time for the next time I’m out there. Overall I’m still not convinced that handling is decreased with the DSC Controller as others on the FocusRS.org forum claim. I’ll have another chance to review and compare again this weekend at two different Autocross events. Let’s see if the results will remain different, yet the same.